Since the information below was written, Case Shiller data has indicated good news for Chicago housing prices. For more detail look at this article in Crain's written by Brian E. Moore of Division Street Capital. As this is being written in November 2012, the consensus is that the national housing market may have finally hit bottom after half a decade of price declines. In fact, the Case Shiller Index shows that the cyclical low point for national housing prices appears to have occurred in February 2012. Prices for the 20 largest metropolitan areas are trending modestly higher. The latest Case Shiller index shows that prices at the top 20 metros have increased by 2.0% year-over-year (August 2011 to August 2012). Not a big increase, but enough to indicate that the bottom has probably been reached and a slight upward trajectory should be expected in the short term. The Case Shiller Index for Chicago shows that prices are continuing their downward trajectory, bucking the national trend. Real estate prices move in cycles and Chicago is right now at or near the cyclical low, comparable to the prices of February 2002. Chicago home prices have dropped for six straight years, down over 30% from the peak. The most recent data from of August 2012 shows that Chicago prices have continued their downward trend , decreasing 1.6% year-over-year. If the prices hold true to trend, Chicago will hit bottom in March 2013 at around 100, the same price as when the index was first benchmarked in January 2000. Below is a graph of the Case Shiller Index from inception for the Chicago metropolitan area compared with the 10 largest metro areas in the United States. The price decrease in small multifamily (two- to four-unit apartments) is even greater, down 55% since the peak (see DePaul Cook County House Price Index, 2nd Qtr 2012 graph below). According to the DePaul data, two- to four-unit prices were at this level in 3rd Quarter 1999. 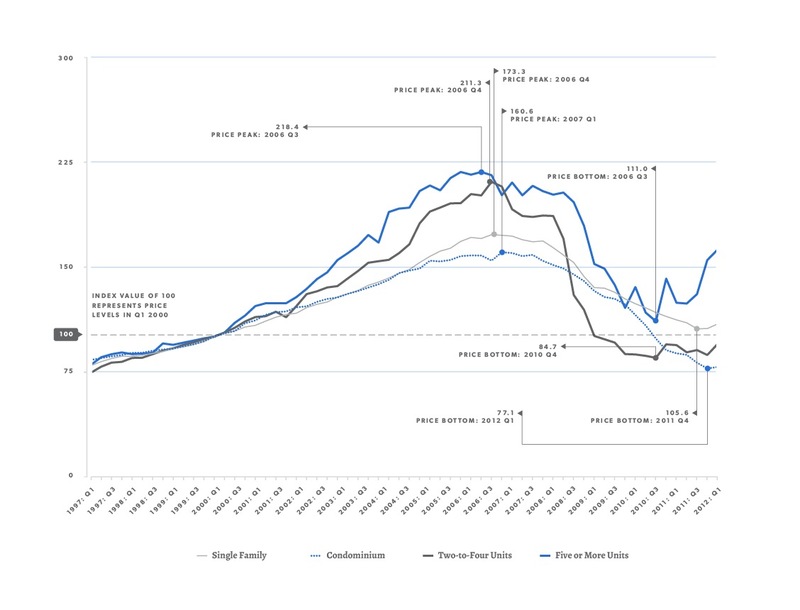 Here is another presentation of the same data which shows that the two- to four-unit prices have fallen behind the other property types (see DePaul Cook County House Price Index, 2nd Qtr 2012 graph below). Why haven't Chicago home prices improved along with the nation? The housing market has three major factors that have kept it depressed. First, is the large number of distressed sales. During the boom in the housing market, there were countless abuses of the mortgage banking system which systemically loaned too much money to too many borrowers. Some of these borrowers should never have been given loans. Many others lost their jobs in the recession and were thus not able to stop a bank foreclosure or took the short sale route in order to preserve some of their good credit. There remains a huge backlog of bank-owned properties (REO) and other properties in various stages of foreclosure. Once these distressed properties work their way through the market, prices will be able to make real gains. This may take some time, see the excerpt from the Freddie Mac Multifamily Demand Forecast on the left of this page. 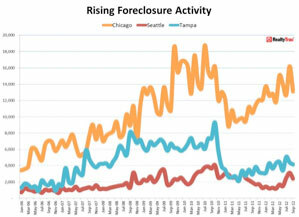 Chicago has the 9th highest foreclosure rate in the nation as of 3rd Quarter 2012 with a foreclosure rate of 5.0%, up 34% from the prior year per RealtyTrac (see graph at right). This indicates that Chicago will continue to lag the nation in home price increases. The second factor depressing home prices is the tightening of credit. This is not necessarily a bad thing from the view of preventing future mortgage meltdowns, but for marginal or even average borrowers, getting a mortgage has become extremely difficult. In addition, down payments requirements have gone up, causing borrowers to delay making a purchase while they save money. Good credit scores are now an unbending requirement to get a loan. Tighter credit requirements have reduced the pool of potential buyers and thus, reduced housing prices. Once some of the risk of further price declines has subsided and there is a clear upward trend in housing prices, banks may begin to relax their credit standards to make more loans in competition for market share. A third factor that has hurt housing prices is market psychology. Many young renters have seen housing prices drop every year since they graduated college (as has been the case for the past six years). Others have friends who have gone through a foreclosure or another distressed sale of their home. It's no wonder they would be hesitant about investing their savings into a home, which looks to them like a sure way to lose their hard-earned money. These young adults are now long-term renters. They have tolerated annual increases in rents and yet don't consider purchasing a home or condo. How long until these folks switch back from renters to buyers? That's anyone's guess. But my gut tells me that as the media continues to publicize that the cost of buying is less than renting by as much as 40% (see graphic at right from Crain's Chicago Business, March 20, 2012) and more and more viral stories of new wealth being created by smart condo buyers in other metro areas, the Chicago population will begin to change their attitudes. But it won't be a rapid shift. In fact, it may take years of these types of media bombardment to get a critical mass of the former renters onto the buyer bandwagon. 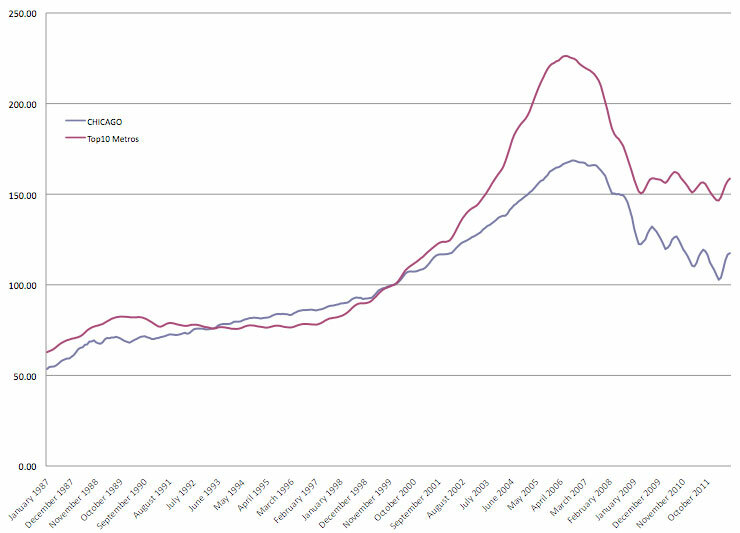 To have an idea where future housing prices will go, we have to look at the Chicago employment numbers. A great indicator of long term demand for housing in any region is the employment statistics. People can't afford to buy homes if they're not working. Therefore, we track the employment numbers reported by the Bureau of Labor Statistics for the broad Chicago metropolitan area, which includes such towns as Naperville and Joliet (see graph below). As you can see, employment has been depressed since mid-2008. The good news is that employment has shown net job growth of 100,000 jobs since the low in January 2010. This bodes well for future demand for residential properties. 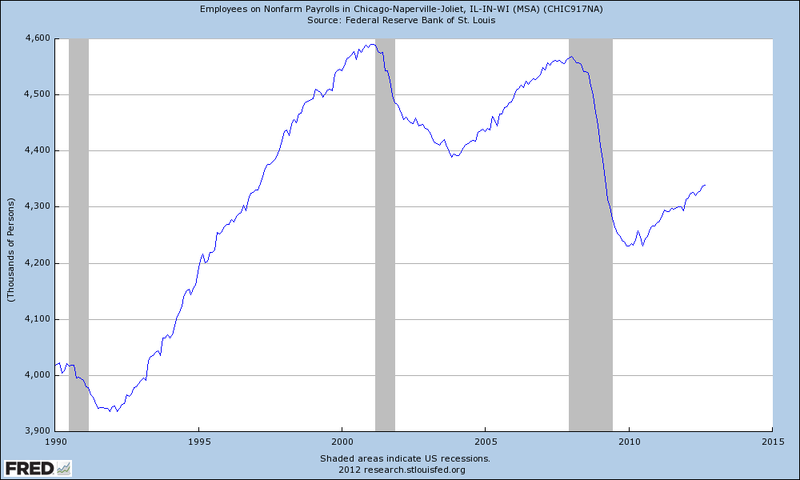 As you can see from the graph, the Chicago metro area has made up about one third of the jobs lost since the peak in 2008. As workers gain confidence that their jobs are secure, they begin to look at purchasing a new home or moving up into a larger home. These types of transactions were common in the early 2000's but have been dramatically curtailed in recent years. Increasing the number of buyers of mid- and upper-level homes will cause prices to increase. What does the future hold for two- to four-unit properties in Chicago? The DePaul Index includes data for all of Cook County. 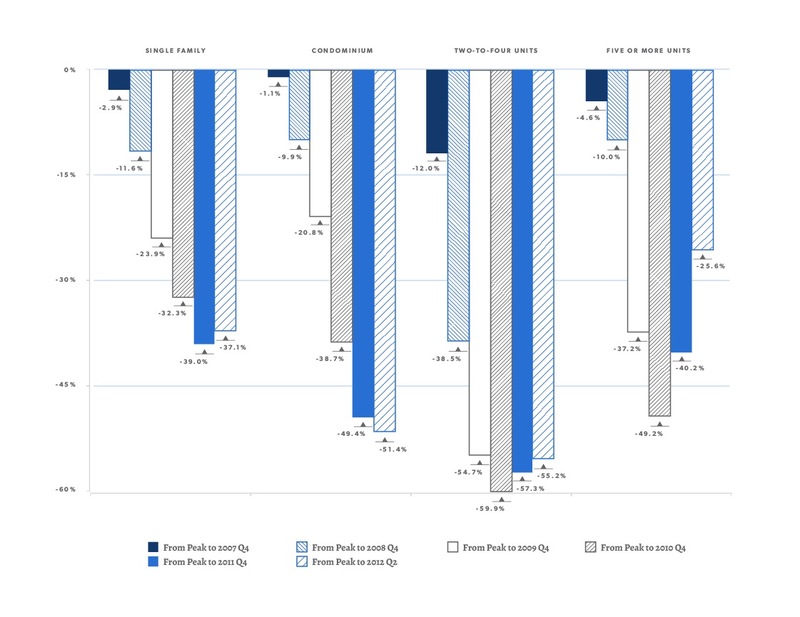 Many neighborhoods in Chicago fared better than the region. Division Street Capital is primarily interested in three-unit properties in a few select neighborhoods within the City of Chicago. Division Street Capital has data from the market peak of early 2007 which is an absolute gem. It contains a key metric that shows how far pricing has fallen and gives a better idea where pricing will head in the future. The metric shows that the price of high-quality 3-flats relative to the annual rents has fallen 26% in the specific neighborhoods that Division Street Capital is following. Since 2007, market rents in these neighborhoods have increased 3-5% per year or about 20% overall. This would seem to make up most of the decline in the pricing metric. However, the owners and managers of two- to four-unit properties are often not sophisticated or aware of the true market rent of their property. Content to do small increases and keep tenants long-term, often times these owners fall substantially below market rents. Another factor in the drop in prices is the number distressed two- to four-unit properties that have come to market priced below $400,000. These properties have typically fallen in to disrepair and are rented far below market. The proportion of these blighted properties that have come to market is much higher than typical, primarily due to economic factors that have affected the single family market. The market for these lower-priced properties is highly liquid since most are priced appropriately for the market. Once these distressed sales work their way out of the market, there will be immediate upward pricing pressure on higher-quality, rehabbed properties and so on, up the chain of value. Division Street Capital analyzes these properties and finds the ones that have highly desirable factors for owners, calculates their expected return and recommends the acquisition of the top performers. The percentage of loans in foreclosure proceedings can be used as a measure of single-family housing market conditions. Based on MBA's National Delinquency Survey, the foreclosure rate has skyrocketed from around 1% in late 2005 to a historical high of 4.6% by 2010; since then it has decreased from the peak but is still at an elevated level of 4.3%. Foreclosures increase both the supply of housing available and the demand for housing. Even with economic growth we do not expect a rapid decline of the foreclosure rate. Over the past several years, the pipeline of non-performing mortgages to be resolved has become large. In addition to various government efforts to reduce distressed sales, delayed bank repossessions, legal issues, property maintenance, and other issues continue to complicate and slow down the current foreclosure process. There are still 1.4 million foreclosures in process and an even higher number of underwater mortgages (11 million) according to the CoreLogic 2012 May Foreclosure Report. Generally, a higher foreclosure rate is an indicator of a weaker homeownership market. We expect high foreclosure volumes to continue.